We think this is a fantastic tube amp for blues harp players at a great price. 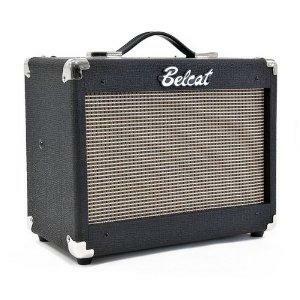 The Belcat Tube-10 features state of the art manufacturing and some of the best components around to create a diverse range of tones ideal for the harmonica player looking for that special sound. It looks great too with leather style covering and tweedesque grill. Kinda like an old 50's amp with a modern edge. The 1 x 6L6 Electro Harmonix tube is combined with 1 x 12AX7 Electro Harmonix tube to create a sound that goes from lush warm clean tones through your dirtier blues drive all the way to blazing Chicago swagger. The 8" Celestion speaker means that you're in safe hands when it comes to delivering your desired sound whether in practise or on stage. At 10 watts of valve power (equivilent to 35watts transistor power) this thing really has a point to prove in the volume stakes.